The Curiosity rover snapped this image of itself on Mars on June 15, 2018. The computer switch took place earlier this week and will allow engineers to gather the data they need to diagnose the problem, which has put Curiosity out of action since Sept. 15. That bug has prevented the rover both from remembering science data and from making its daily journal notes — and that second process is crucial for figuring out what's wrong and how to fix it. When possible, NASA loads its spacecraft with twin computers to make the system redundant in case of error. Curiosity's paired computers are called Side A and Side B. The rover began its tenure on Mars using Side A but switched to Side B in 2013 when a series of computer glitches took the machine offline for more than a month. Engineers revealed years later that the incident almost marked the end of Curiosity's mission. But the rover's handlers were eventually able to get the Side A computer back in working order. That's the computer Curiosity has now switched to using while engineers continue to investigate the memory errors in the Side B machine. 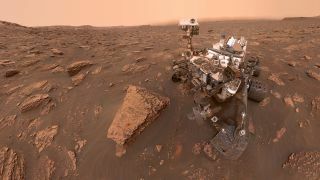 "At this point, we're confident we'll be getting back to full operations, but it's too early to say how soon," Steven Lee, Curiosity's deputy project manager at NASA's Jet Propulsion Laboratory, said in the statement. "We are operating on Side A starting today, but it could take us time to fully understand the root cause of the issue and devise work-arounds for the memory on Side B." That said, in the long run, the team hopes to switch back to Side B, which has a bigger memory.